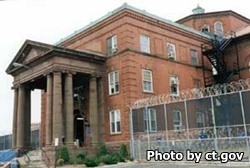 Located in Cheshire Connecticut, the Cheshire Correctional Institution is a level 4, high security facility that houses adult offenders who are serving long sentences. The facility is home to over 1,300 inmates, and operates multiple units within the facility include the general population of inmates, a protective custody unit, and special management unit. This facility also incarcerates a small number of pre-trial inmates, currently around 60. Cheshire Correctional Institution offers inmates vocational and educational programs that benefit the surrounding communities, while at the same time help teach an inmate vital life and work related skills. To visit an inmate at this institution you will need to fill out a visitors application and wait for it to be approved. General population has visiting Monday, Tuesday, Thursday and Friday in one hour blocks starting at 9:15am, 12:15pm, 1:30pm, 6pm, and 7:15pm. On Wednesdays in one hour blocks starting at 12:15pm, 1:30pm, 6pm, 7:15pm, and on the weekends in one hour blocks starting at 12:15pm, 1:30pm, 6pm, 7:15pm and 8:30pm. North Block 4 PC Upper Tier has visiting Saturdays 8am-9:30am and Sundays 10am-11:30am. North Block 4 PC Lower Tier has visiting Saturdays from 10am-11:30am, and Sundays 8am-9:30am. Special Management inmates have visiting blocks starting at the following times: Mondays 8am, Tuesdays 8am and 8:30pm, Wednesdays 8:30pm, and Thursdays 8am. Annex Visiting is in two sessions, on Monday-Friday, first at 7pm-8pm and second at 8:15pm-9:15pm. Read this schedule for more detailed visiting hours at Cheshire Correctional Institution.